A uniquely refreshing wine beverage with a bold splash of ripe fruit. The Niagara name has become synonymous with incredible wines and wonderfully tasty fruits. 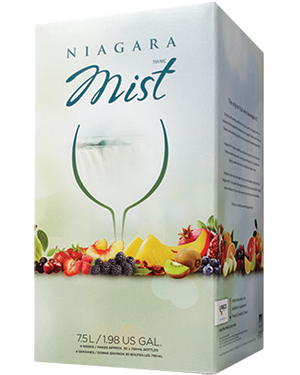 Niagara Mist combines famous wine styles with sassy fruit flavours. These delightfully light and refreshing, exciting combinations are the perfect beverage choice for any occasion. You’ll enjoy the super enhanced characteristics of fresh red berries and luscious black cherries. Pair this fruit forward wine with a salmon topped salad for a culinary delight. The intense fruit flavours and refreshing notes of blackberry dance on the palate. This slightly bold fruity wine will harmonize with the spicy flavours of beef empanadas and spicy meat pies. This smooth wine has invigorating fruit flavours of plump sun-ripened berries combined with the natural blackberry character. A perfect sweet and velvety beverage for summer sipping with a grilled burger on the side. Green apple sweetness is balanced with a crisp finish making this wine exceptionally refreshing. This tangy beachside beverage is great with summer salads and seafoods. With its enticingly vibrant peach nose, gentle bite of tart acidity, and lingering apple finish, new Orchard Crisp delivers crisp, fresh-from-the-orchard fruit from start to finish. Bursting with aromas and flavours of juicy sweet pineapple, mango and kiwi, subtle citrus notes create the perfect clean crisp finish. A delicious refresher any time with a tangy Asian salad or chicken stir-fry.